If you have yet to see a black bear up close, you're missing an exquisite example of nature's beauty and majesty. 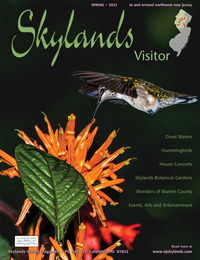 Here in the Skylands region of New Jersey some residents can catch a glimpse right in their own backyards. They are the most common bear in North America and are certainly not strangers to the Garden State. The black bear is present in 11 of the 21 counties. In northern New Jersey this regal creature maintains its presence as a valuable asset as well as a symbol of the last remaining wilderness areas. American black bear are approximately five feet long and vary in weight. Females range from 200 to 300 pounds and males are 350 to as much as 600 pounds depending on age, availability of food and time of the year. They are not necessarily black, but may be brown or even cinnamon-colored. Luckily, they are much better than the brown bear at coexisting with humans. Black bears are not typically aggressive. They will usually flee when confronted. They are generally solitary animals except for breeding and raising their young. The black bear population in the Skylands region has risen to 50 times what is was two decades ago. It is at an estimated all-time high of 1,000 animals and growing. There are 600 bears tagged by the Division of Fish, Game and Wildlife in New Jersey. Using current information on birth, death and survival rates on the tagged bears, it is estimated their numbers will continue to rise. Humans have taken over much of the bear's original habitat. The loss of their homes has forced the bears to adapt to humans. And this highly intelligent creature has done just that. In New Jersey the black bear lives in the wild without any specific designation. Black bear prefer to live in dense cover, such as forests, cedar swamps, thickets, brush and clear cuts populated with saplings. Their choice of home range is determined by the types and availability of food. They roam throughout the summer in search of food sources. Females will travel roughly 10 square miles, and males may go up to 50 square miles from home. Several bears may share the same territory if there is enough food to go around, but the dominant male will defend his territory fiercely. Black bears are excellent tree climbers, even as cubs, and use trees to escape danger. They are also highly adaptable within their habitat; they can live in both arid and moist forests. Although much of the bear's historical habitat has now been populated by humans, this ingenious animal has managed not only to survive but to thrive. Black bears generally live about 10 years, though a few may survive twice that period. The most important known mortality factor for the black bear is vehicle kills. According to the Division of Fish and Game, 46 road-killed bears were recovered in 1999. 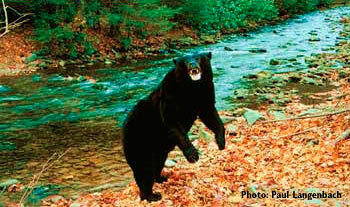 In New Jersey, black bear commonly live into their teens, which may be due to the abundance of food in this area. According to Patrick Carr, a Wildlife Biologist at the Division, black bears in New Jersey breed at roughly two to three years of age as compared to places such as Montana where the bears are five and six years before they breed. This is due to the optimal food sources here in New Jersey. They have not only an abundance of food, but also a varied selection. Stay calm and use common sense. Never approach the animal. Most bears are easily frightened into leaving. Do not feed the bears! Bears that associate food with people may become aggressive and dangerous. Keep at least 15 feet away from the animal. If you are at close range, remain standing, avoid direct eye contact. Back up slowly and speak in a calm, assertive and assuring voice. Make sure the bear has an escape route. Sometimes bears will "bluff charge" when cornered. Yell, bang pots, or use an airhorn to scare the bear away. If the bear will not leave, move to your house, car or building if available. If a bear sounds a series of huffs or snap or pop its jaws and swat the ground, it is a warning sign that you are too close. Slowly back away! Depending on the season, the bears will find cherries, acorns, grasses, various kinds of berries, tree bark, corn, and even bee hives to choose from. Their fur is bee-proof and the occasional sting on the nose is well worth the honey they may find. Bears are omnivores, meaning they eat many different kinds of animal and plant food. They can eat just about anything of nutritional value. Being opportunistic feeders no food source is ever overlooked. They eat what they find. Although vegetation makes up most of their diet, ants from an anthill, road kill or even the occasion fawn will serve as well. And they will help themselves to seeds in a bird feeder or a squirrel's stash of nuts if they sniff it out. The bears need to add fat to get through their winter denning period. When they emerge in the spring in a fairly groggy state, they don't eat for about two to three weeks. Then they feed non-stop until September. That last month prior to denning they're consuming up to 20,000 calories a day. They will need 50 to 60 pounds of fat to sustain them through the winter months. Most people think that bears hibernate, but in fact, they do not. They go through a period of dormancy known as denning. The bears will make a den someplace secluded where they will not be found or disturbed, such as hollow trees, small caves, large excavation under roots of a tree, or the side of a dirt hill. Rugged terrain and dense shrubs provide escape cover and optimal den sites. They will not reuse their dens, but may use an old den of another bear from a previous winter. The space cannot be too large as they will need to conserve body heat. The site will be prepared about one month in advance of their late November to early December denning time. The bears fall into a deep, yet not unbreakable slumber. They can be startled awake, though I wouldn't want to be the one who does it! And sometimes unseasonably warm weather can fool them into thinking spring has arrived. They may awaken briefly and go out for a walk sort of sleepily. During their extended sleep their body temperature remains near normal at 96 degrees and their heart rate slows to 10 beats per minute. Within this five-month nap period, the bears do not urinate, defecate, eat or drink. All the water and calories necessary are provided to them by the four-inch layer of fat they have established prior to their slumber. Some time in the months of January or February a female that is in her winter den will give birth to one to four bear cubs. These sows mate normally every other year typically producing 20 to 30 cubs in her lifetime. Black bears mate in June and early July. The boars are drawn to the scent about a week before she actually goes into heat. The bears spend this time kind of "dating," just getting used to each other. The eggs are fertilized and carried inside her fallopian tubes for five months before implanting on the uterine wall. However, if the female does not put on the needed fat for denning, the pregnancy will be spontaneously aborted. Embryonic growth takes two months and two to five cubs will be born in January. They are hairless, blind, and eight ounces at birth. A first-time mother will probably have one cub and commonly twins after that. The cubs grow rapidly and emerge with their mother in May. By 10 months old the cubs may weigh over 50 pounds, but are still easy prey without mother at their side. Humans, brown bears, and male black bears are the most dangerous enemies for the cubs. Even very young the cubs are proficient climbers and use their skill to protect themselves. The females make wonderful mothers giving their babies constant attention, holding them on their laps in a human-like stance or carrying them on their backs. The cubs stay with their mothers for only the first two winters. Their survival depends greatly on what's learned in this time and their mother's skill in teaching the cubs what to eat, where and how to forage, where to den, and when and where to seek shelter from heat or danger. The cubs are usually independent by the second winter. At five years a typical cub will weigh 200 pounds and can kill a deer of equal weight. A young adult female is often allowed to establish her territory within that of her mother's while subadult males must go out on their own. Though issues of habitat and human tolerance remain, officials and residents of New Jersey are currently working to maintain this unique predator as a positive part of New Jersey's wildlife.